Today JimBob looks at an up and coming Cat who adds to the already cramped umbrella of ‘value forwards’, but who knows if he will get the extra midfield time to set him apart from the pack? Caddy started the 2013 season in the vest 3 out of the 4 games (1 red and 2 green), suffered a concussion in round 5 and after only averaging 38 in the first 5 rounds, was only seen once in the next 8 weeks in the first team. During this time he only played 3 games in the VFL so was likely injured (would love to confirm this, but I’m on holiday). Once Caddy returned to the first team in round 14, he came out in a mid/forward role and started with a bang. Caddy scored 80, 85, 104 and 86 and stayed in the team for the rest of the season, averaging 77 in the last 8 games. For the rest of the season, Caddy managed to avoid the vest all but once, but like the vest mattered, scoring 86 in half against the eagles in round 21. While it was all in junk time, I couldn’t care less, I love a player who junks it up! Now the only reason (and I think its a big one) to consider Caddy is the fact that he is available in the fwd line in 2014 and based on his last 8 games comes with a handy 14 point discount. You would think his days of being a vest candidate are over and there is even an article about the obligatory more midfield time for Caddy! As other writers of the deck of DT have already pointed out, there is a fair bit of value in the forward line this year. Below Caddy’s starting price are players such as Fasolo, Clark, Bock and Rohan and it is more likely that some of these players will give you quicker cash generation early on in the season than Caddy. There are still a few too many question marks on Caddy. Will he be a top 10 forward? I don’t think so, Will he get the mooted midfield time, or continue in a fwd mid role where he will need to be kicking goals regularly to get a solid score? . Also, the draw for Geelong before the bye would be rated moderately hard, so I don’t think Caddy is worth considering in your initial team purely based on Geelong jumping out of the blocks. 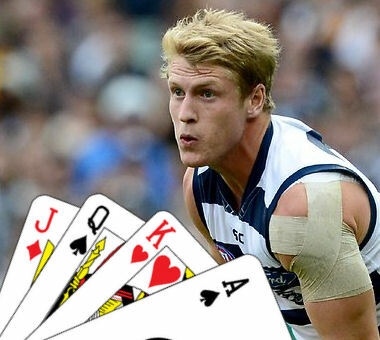 Now I think Caddy will be a gun footballer – Geelong don’t part with a first round draft pick for a dud, but if his role translates into a DT friendly role is still to be decided. I think that Caddy won’t be the sort of player that you should consider in real DT, as I don’t think that he will be a top 10 fwd (a keeper) and his price suggests there wont be enough room to increase his cash quick. Like many other players, he may be worth a gamble in classic due to the 2 trades a week and be a good point of difference. A breakout for Caddy looms, but would like to see a bit more data and clarity on his position in the team before jumping on. Good food for thought there Jimbob. A couple of spots have opened up in the Cats midfield rotations and can see Caddy going close to an 80pt average if he gets the opportunity for more midfield time. Can’t quite fit him in at this stage but will be watching him in the Nab Challenge with interest.